The bodywork is made from memory system plastic, designed specifically to withstand and absorb impacts of over 10G. There are four practical handles for lifting the vehicle: two within the front bodywork and two at the rear. All the fenders are attached to the chassis by means of rubber inserts to isolate them from the chassis structure, thus ensuring increased safety on impact. 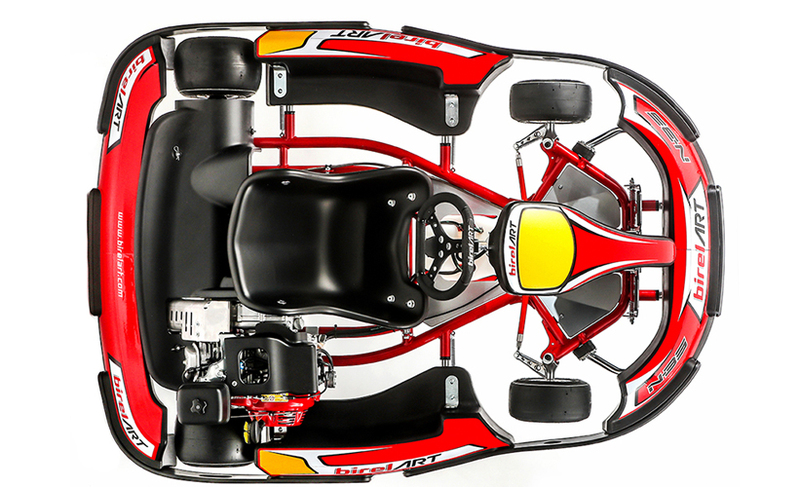 The plastic rubbing strips protect the extremities of the chassis, connecting all the bodywork elements, so as to absorb impacts and limit damage to the chassis, wheels and the kart’s mechanical parts. The seat is plastic, mounted to a steel frame on runners that allow for a range of movement of 80 mm. The adjuster handle is conveniently situated on the left side of the seat. It is possible, on request, to have a version with a fixed seat. Adjustable manually or by means of a cable from a lever on the right side of the seat, which can be operated by the driver, with a range of movement of 30 mm. A new SDBS (slowing down brake system) which comes into action during braking, reducing the speed of the vehicle by operating on the throttle return cable. A Ø 22 mm master cylinder with separate fluid reservoir above the cylinder. Calliper with two Ø 38 mm pistons with road-car derived pads for longer life, which work on stainless steel runners to reduce friction and increase mileage. Aeronautical standard nylon brake lines, covered in stainless steel weave to withstand over 1000 bar pressure. Steel Ø 180 mm x 8 mm Wave disc, fitted to a fully machined aluminium calliper. Spindles with cast stainless steel body, with pressed lever and removable wheel axle by means of a fixing bolt. Steering tie rods made from special plastic material with aluminium bushes to fix uniball. Steel steering column with two positions to allow variations in steering geometry so as to choose the most suitable, according to use (indoor track, outdoor track, short, quick, mixed…) Each front wheel is mounted on four bearings to reduce axle loads as much as possible. Angled steering wheel support in pressed aluminium. 320 mm leather-covered steering wheel. 12-litre tank with automotive type bayonet fitting, accessible via a flap on the top surface of the bodywork for the RS model. Traditional fuel tank with 10-litre capacity for the ST and GT models. Axle made of molybdenum chrome steel with Ø 40 mm x 5 mm thickness, mounted on four bearings. Rear hubs made from fully machined aluminium with Ø 40 mm x 100 mm length, which are fixed with an 8 mm key that blocks the hub. The karts can be fitted with exhaust silencers tailor-made for the Honda GX 200-270-390 and Briggs & Stratton 210-300-420 engines and are designed to increase performance and reduce both CO2 emissions and noise. Designed specifically to adjust the position of the pedals, according to the height of the driver. By operating the lever, the pedals disengage so they can be set at the ideal driving position. Ergonomic headrest with rubber padding, complete with safety straps attached to two mounting points. Made from Ø 35x2 mm chrome molybdenum, with additional strengthening at key points. The design is derived from experience gained in racing, to produce a real Wow effect when driving.